I bought my first hat on the beach in Pompano Florida during some sort of festival in or about December a number of years ago. It has been the most wonderful hat and I cannot do without it in the winter in northern New York. It is everything it is advertised to be and it would have lasted for a hundred years had I not lost the damned thing in a shopping mall last night. Its a lot of money for a hat but I cannot live without mine! I am buying this hat because I just "lost" mine last night in a shopping mall. I cannot live without this hat. It is everything it is advertised to be. I live in a very cold climate and it is my winter hat. Its warm and keeps the rain and snow off me and I just love it, pricey though it admittedly is. been wearing the sundowner for 11 years. always have it on when out – regardless of the temperature.on my 3rd and and 4th hat – natural and black. will be getting another in black due to my hair getting longer and i need more room in the hat. I received this hat as a gift from a good friend when we were thirteen years old. I’m now 26. And the hat still goes everywhere with me, and after half my life this hat is just now starting to lose the trim around the edge of the brim. Love this dang hat! I’m going to be buying a backup hat next paycheck to replace it. Well worth the money for a lid that never fails me! I was 16 Years old as i visit a trade fair in Düsseldorf ( Germany ). However, 10 days in the year i clean my hat with leather fat and the rest of the year ( 355 days ) i wear it. That´s true. By every weather, sun, rain, storm, snow … every time i wear this hat and visit during this time 9 different European countries. Now i am 29 years old and the leather become at the brim of my hat crackly and brittle so i must buy m a new one soon. ( Because of one animal attacks and the strain from weather and temperature i give the hat to a saddler for repairing two times but now i think the material reach his limit ). But what i try to explain. Please, show me one other hat that you can wear in 355 days over 13 years by every weather and temperature through forests, swamps, mountains, rivers, sea and it´s still protect your head. 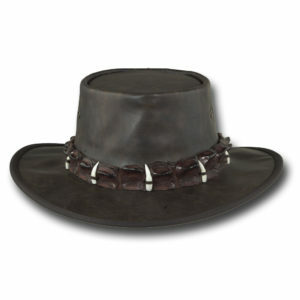 I believe that this leather hat can protect your head effective about many years.